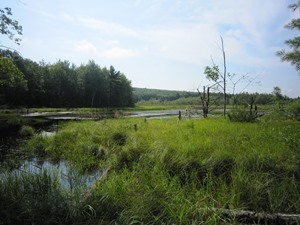 This project conserved approximately 92 acres of woodlands and wetlands that comprise the major portion of the headwaters of Suckfish Brook. It contains one of the few northern peat bog habitats in the Greater Portland area. Additionally, the project included repair of an eroding woods road to stop siltation into Suckfish Brook. The unique habitat and watershed protection values made the project a high priority for acquisition by the town's Conservation Commission.